Retirement is a life-long dream – one where you say goodbye to traditional work and your time becomes genuinely yours. But retiring well takes work. Ensuring happiness and comfort during this next chapter means proper planning, both financially and personally. Are you there yet? Take a look at this list of five significant planning questions to answer before retirement and see how many you can tick off your list. 1. Do you have enough money to retire comfortably? Your answer to this question will depend on your unique set of circumstances, lifestyle, and expectations. While it’s good to save conservatively for retirement, not everyone needs $1 million or more socked away in order to be happy and fulfilled. In fact, the research for my book, You Can Retire Sooner Than You Think, indicated that the sweet-spot of retirement savings for the happiest retirees was around $500,000. When considering how much you need versus how much you have, remember our $1,000 bucks-a-month guideline. This handy rule of thumb states that you need $240,000 in assets for every $1,000 per month income you want in retirement, assuming a 5% dividend yield. Using this rule as a guideline, once you know your projected (and desired) spending level you can work backward from there to make sure your assets and income streams will support your lifestyle. If you’re within range, then bravo! But if not, now’s the time to make tweaks to get to where you want to be. 2. Do you understand your investment strategy? First off, it’s imperative that you understand your particular risk tolerance – it’s the blueprint for how you allocate your portfolio. What I mean by this term is simply the amount of investment risk you are willing to withstand. Typically, your tolerance is influenced by where you are on your retirement timeline. If, for instance, you have 20 or more years until you’re ready to hand in your keys and parking pass, then you probably have more risk tolerance than someone looking to retire in a handful of years. Personally, I’m a true believer in the power of income investing. The basis of this approach is a focus on generating cash flow from your investments. This may include holdings such as stock dividends, bond interest, or similar types of assets. The income is then reinvested to help quicken the growth of your portfolio until you retire when it can be redirected to provide you with a “paycheck” to help cover your spending needs. This strategy is a balanced way to capture both growth and income from your portfolio. 3. 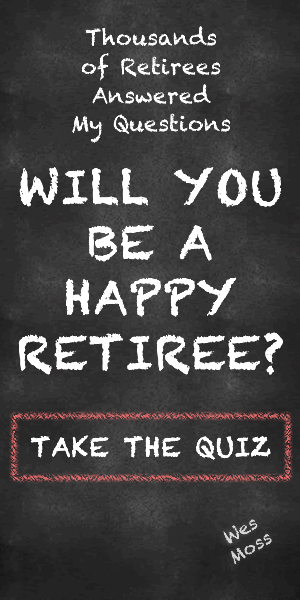 Are you prepared for the psychological changes that come with retirement? Often, folks find themselves scared to make withdrawals from their nest egg – no matter how large. When you stop saving and start using your retirement money, it’s a different emotional ball game. “Wes, I’m concerned that I’ll run out of money.” I’ve heard this fear from people with a healthy $500,000 in savings and from others blessed with $5 million in assets. The fix for this fear is to educate yourself (or better yet, work with a professional) on the basics of income investing. Also, practice prudence with your withdrawals and consider following the 4% Rule. Stay the course and, if you are smart in your spending, you should enjoy many years of financial security. 4. Do you have an aging plan in place? Getting older ain’t for sissies. Planning for the curve balls aging will inevitably throw us is our best defense against getting caught off-guard by things like expensive medications, visits with specialists, or even long-term care. Prepare, and then go with the flow! For starters, you probably want to create an estate plan that includes a simple will, financial power of attorney, and advance directive for health care. The will is to direct where your property goes when you pass away, allowing you to make the decision, rather than the laws of the state in which you live. The financial power of attorney and advance directive for health care allows you to determine who will care for your finances and make health care decisions for you if you are ever unable to do so. Think about these documents like insurance policies; you may never need them, but it’s good to have them if you do. One final thing to consider is long-term care insurance. Remember, Medicare doesn’t pay for extended stays in nursing homes, and this type of long-term care can get expensive. So, this insurance could save you from a budget-shattering expense. Consider working with a healthcare professional, like Shop Benefits or US Health Advisors, to help you weigh your options. 5. Do you have plans for your newfound free time? While retirement planning is predominantly a financial endeavor, it’s a personal one, too. New retirees sometimes find themselves with too much free time on their hands. Nip this problem in the bud by taking time to explore and develop hobbies and other passions in the run-up to your retirement. I call these activities “core pursuits,” and, I believe, they are crucial for a happy retirement. Spend your time doing what you love, and you’ll be using your free time to the fullest. It doesn’t matter if you’re golfing, gardening, volunteering or working at a part-time job that piques your interest and expertise. What you do matters far less than the fact that you’re engaging with something. So, get out there and have some fun! Not only will you enjoy the process, but you could set yourself up for a happier retirement along the way.